I’m having trouble with the current book. I’m at a crossroad in the plot and I can’t decide which way to go. At the moment, both roads seem to lead to a quagmire. 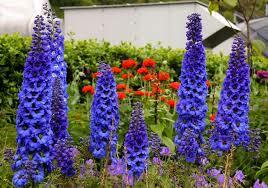 So I’ve been thinking about flowers, specifically about delphiniums.